Eighteen years ago, I remember driving through an ice storm during a Level 3 Snow Emergency, in the middle of night. Your mom was in labor, and Mamaw was clinging to Katelyn in the backseat. Looking back, I had no real concept of how much our lives were about to change, and then you arrived. I was amazed by the beautiful complexity of your being, and am even more so all these years later. From the beginning, you were anything but typical, and I knew that God had something special in mind when He created you. Even in your childhood, I’ve seen Him use the special gifts He’s given you, and I believe that they will only get stronger. I know that the world has not always been kind to you, but never forget that this is not your home. I wish I could promise you that things will get easier, but it’s doubtful they will. Just know that God has made you strong, and that with HIm there isn’t anything that you cannot overcome. You were always in a big hurry to grow up, and as of today, the world recognizes you as an adult. But remember what I told you, “You’ll know that you’re grown up when you can take care of yourself, and you’ll know that you’re a man when you can take care of someone else; because God never made a man to simply take care of himself”. It’s hard to know that you’ll be leaving in just a matter of months, but you were born to fly, and I would never want to hold you back. Please know that wherever the road takes you, my prayers will go before you and that my heart will be with you. You’ve never taken the easy road, so it’s not surprising that you’d become a Marine. I believe that you’re up to that challenge, and I’m proud of your strong desire to serve. Though I was given the great privilege of being your dad, never forget that you have a Father that is greater than I. He loved you first, and He loves you best, and long after I’m gone, He will remain. Let His voice be loud in your ears, let His light illuminate your path, and let His heart beat in your chest. He will never leave you, nor forsake you. I always knew that it was my job to guide you towards manhood, but I guess I hoped I might have a little more time. 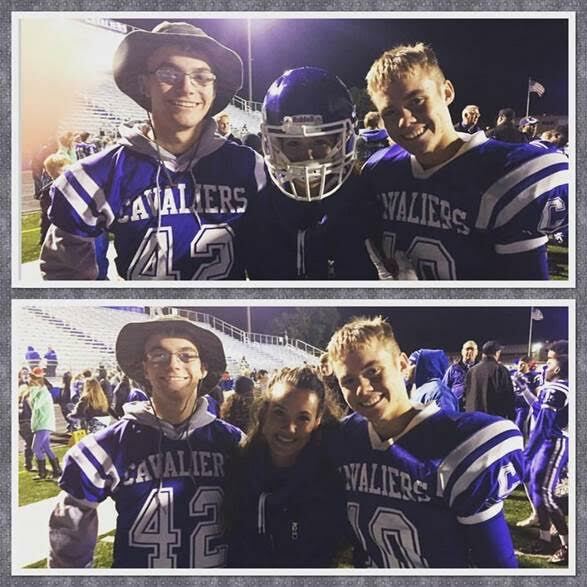 I’m so proud of the man you’ve become, and I believe that you are ready for what lies ahead. .
Last Friday evening was Senior Night for the football team, and we parents were encouraged to write a letter to our Senior player. I’ve pasted a copy of that letter below. Though his mother is just as proud of him (and he knows it), we agreed that some things need to be said in a father’s voice, and so I wrote it from that perspective. Well, here we are closing another chapter from your childhood. I feel like we’re going to do a lot of that this year. It seems like you’ve been playing football forever, but I remember the beginning as though it were yesterday. As much as I was surprised by your brother sticking with the game, it was a no-brainer that this would be a part of your journey. From your first day on this earth, you were long on passion and short on fear. I remember you playing on the line during Pee-Wee ball. You were really undersized for your position, but that never stopped you from taking on the biggest guys on the opposing team. I specifically recall a Unioto scrimmage, where you got low and lifted a kid, who outweighed you by at least 50 pounds, off the ground. It was just one of those pictures that will forever be etched in my memory, because it helped me to understand who you are. I remember the year when you decided not to play because some of your teammates made you feel like you didn’t belong; but when Coach Bonner called and said the team needed you, you stepped right up. I remember the year, when the team only had 13 players, and everyone had to play both ways. Somehow you guys still managed to have a winning season. And I remember last year, when your arm was shattered in the Clinton-Massie game. Though people on the sidelines and in the stands were horrified at the sight of it, you never made a sound, and wanted to stay until the game was over. As much as I love football, your participation in the sport has never really been about the game itself. It was about getting stronger and pushing yourself beyond what you thought you could do. It was about sticking to a commitment, even when it was hard, and overcoming adversity. It was about being a part of a team, and making sacrifices for something bigger than yourself. Ultimately, it was about preparing you for life, and from that standpoint it has been an unmitigated success. Even though we place a huge emphasis on education, life isn’t much like a classroom. In truth, it’s a lot more like a football field. The classroom is a controlled environment, with a set script and a seat for every student. But life is not something we can control, and it cannot be scripted. It comes with bad field conditions, and injuries, and adversaries who hope to stand in the way of our victory. It comes with dropped passes, and interceptions, and blindside hits. In the end, it is our ability to deal with these hardships that sets the stage for our victory. I know that in some ways the final chapter of your football career has been a disappointment. I know that you never envisioned spending your senior season on the sideline in a cast, but as I’ve watched you cheer on your teammates, and lift your younger brother up, I want you to know that I’m not disappointed. It takes a far bigger man to celebrate other people having the success they hoped would be their own than it does to make tackles or to catch passes. I can’t help but admire a man who can set aside his own disappointment and lift up the people around him. From where I sit, that is the sort of man that you’re becoming. Tonight, as your mother and I walk across the field with you, I will surely shed a few tears (because that’s how I am), but I won’t be sad. I will be grateful for the years you’ve played, and the teammates and coaches you’ve played with, and the things you’ve learned, and the strength you’ve gained. I will be thankful for the injuries that never happened, for the care you received for the ones that did; for all the wins, and even for some of the losses. But most of all, I will be humbled by the privilege of being your dad, and for the man God made you to be. I love you son, and I couldn’t be more proud of you. Our son Patrick made what promises to be a life-changing commitment yesterday, as he signed a contract with the United States Marine Corps. Under the terms of this agreement, he pledged to become a member of the active duty service upon the completion of high school, and within the next 12 months. As such, he was sworn into the Inactive Reserve component of the Marines and will work with the Recruiting Command for the interim period, in preparation for his service. 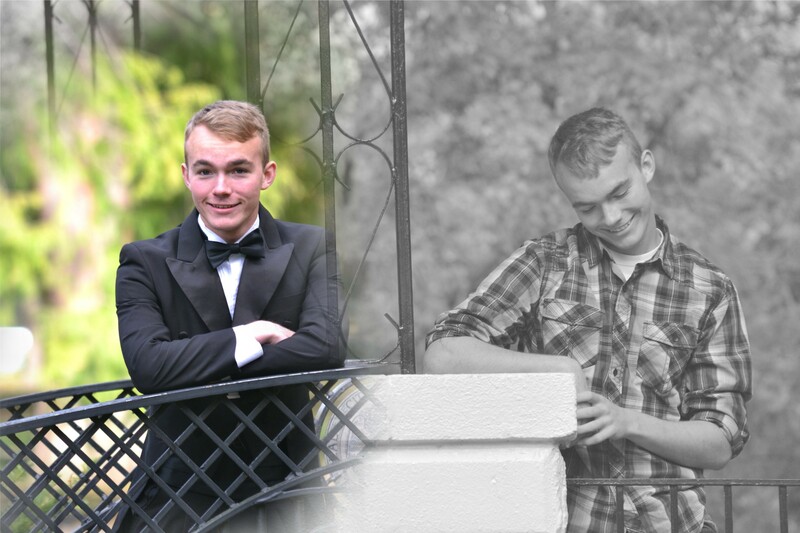 If the schedule holds, he will be leaving for Parris Island within a few weeks of graduation. It was a serious step and one that I believe he was ready to make. There are some who would question the wisdom of allowing our 17 year old son to make such a commitment, and to be sure, it wasn’t something we came to suddenly or lightly. In fact, this was really the culmination of a journey that began the moment he was born. On that day, I wrote him a letter, which I’ve linked to this article (go tohttps://bryancorbin.com/2010/02/15/letter-to-my-newborn/ ). Within it, I acknowledge that the season of our influence would be relatively short, and I express my desire for him to become the person he was created to be. Ever since then I’ve been looking for clues as to who that might be. From day one, he was a high energy action figure. Climbing, jumping, talking, singing, dancing, laughing… he was always ready to charge up the hill, even when no one was willing to follow. He started in soccer at age 5, and through the years he’s continued with basketball, football, baseball, and wrestling. And for him, it has never been about winning games, it has always been about going into battle alongside his brothers. The military tradition is strong on both sides of our family. My wife’s grandfather was in the Army during World War II, her brother enlisted in the Air Force, and my kids were old enough to remember when her cousin was in Iraq. My father and his brother were both career military men and Vietnam vets. My dad did 26 years in the Air Force, and my Uncle did 29 years in the Marines. My brother and I joined the Navy together, and I eventually did 12 years of service. From a young age, Patrick loved Veteran’s Day, and beamed when I’d come to the school programs. Years ago, as we visited some old mothballed ships in Charleston, he bought a US Marine flag that hangs over his bed to this day. As he grew, many other gifts emerged, and we pondered whether these other things (e.g. acting, singing, dancing, drawing) might be a pathway to a different future. For the last couple of years we’ve talked a lot about potential careers and colleges, but it all seemed to have an unsettling effect on him. The further we went down those avenues, the more confused he seemed to become. At times, he even wondered aloud at who he was supposed to be. Eventually, I realized that he was simply afraid of disappointing us and that these things weren’t really what he was after. As we revisited the idea of the military, he seemed to come alive. As I prayed about how best to guide him, God seemed to remind me of who Patrick is at his core, and I began to feel the momentum building toward this end. Even though he’s grown up in a time when these things are not especially valued, he passionately believes in the concepts of duty, faithfulness, honor, accountability, courage, and valor. The fact that things are hard or dangerous doesn’t seem to hinder him. And in the end, I concluded that what we wanted for Patrick wasn’t nearly as important as helping him discover who he was made to be, and encouraging him down that path. Again, there are those who might question the idea of embracing what could be a dangerous road for our son to go down, but I would submit that there is no pathway forward that is without risk. Indeed, one need only watch the news to see that peril can appear anywhere and without warning. Our world needs brave men (like Pat), who are willing to step into the unknown, and to make a stand for the things that truly matter. Though we clearly recognize what is at stake, how can we justify trying to inhibit him from answering that call. No parent wants to ponder the possibilities, and Lord knows that we will be praying fervently, but if this is who he was created to be, we’ll have to fight the Creator in order to make him something else. We did require him to look at all four branches of the service, and he did like them all to some degree. But everything about the Marines seemed to fit; heck, even his recruiter is named Staff-Sgt. Corbin. None of us knows the future. This could simply be a necessary step in Pat’s preparation for something else, or maybe this will be the place that Pat shines his light for years to come. I firmly believe that the steps of a righteous man are ordered by God, and that He works all things to the good of those who love Him and who are trying to fulfill His purposes in their lives. I believe that Patrick is that kind of man. As a parent, our strong impulse is to protect our kids; but just as important is the need to prepare them to make a life of their own. Though we will always love them, they were never meant to remain our children (i.e. be dependent on us). I’m proud of Patrick’s decision to jump into adulthood with both feet. It is typical of the way he’s always done things. He is full of passion and low on fear. I’m proud that in an age of entitlement, he embraces the values of service, and sacrifice. I’m proud that he’s not tempted by the path of least resistance, which I’ve come to view as the road to hell. Just like the night he was born, I’ll struggle to let him go. But I will. I always knew that the day would come when I’d have to put him back in the hands of the One who handed him to me. Yesterday, as I combed the internet looking for contact information for my best friend from high school (Mike), I came across the obituary of his mother, Laura McAfee. Apparently, she passed back in August, which shouldn’t have been surprising, as she was in her eighties. Yet, I was somehow caught off guard, and a profound sense of loss swept over me as I looked at her picture. My association with this remarkable woman dates back over 35 years, when her son became my closest friend. It was a season in my life when I was floundering to find my identity, and this wonderful family turned out to be a God-send. Though Mike and I didn’t necessarily make great decisions together, our friendship was as substantial and genuine as any I’ve ever experienced. At a time when I desperately needed someone (other than my own family) to believe in me, he did; and so did his mom. When I joined the military, it took our lives in different directions, but whenever I was trying to get in touch with Mike, I always knew to start with Mrs. M. She and I had many wonderful conversations over the years, and I sensed an incredible depth to her being (i.e. intellectually, emotionally, and spiritually). As a black woman, born in the south, during the 1930’s, I can only imagine the tales she could have shared; but this highly intelligent, highly educated woman never let our conversations be about her. Instead, she was a fountain of warmth and wisdom to and for me. I suppose that shouldn’t have been surprising either, as her life’s work had been that of a teacher. Last night, as I sat at my computer, I found myself wishing that I had asked her more questions about her life, and had thanked her more profusely for her generosity toward me. I can’t help but lament that the opportunity to do so is now lost. Thankfully, I’m the sort of person who believes that there is another life that comes after this one, and I have every confidence that this beautiful soul has taken up residence in that place. Her legacy lives on in the hearts and minds of her two amazing kids (Mike and Michelle), and in her grandchildren. Her memory has haunted me today, and so I decided to pen this little tribute. For me, it is not sports figures, celebrities, or heads of state that have ever been my heroes, it is people like Laura McAfee, whose amazing heart touches the people around them. Rest in peace my dear friend. Clearly, I meant to post this yesterday. But, as is so often the case, things got away from me. Over the years I’ve written a few tributes to my father, but I don’t recall ever doing so for my mom. I’m sure this has to do with the fact that my dad contracted a terminal illness (and passed away) at a relatively young age. But honor shouldn’t be reserved for the dead, and kind words ought not be saved for eulogies. So on the occasion of Mother’s Day, I thought it would be fitting to share a few thoughts about my mother. My parents had four children, three stair step boys, and then, more than a decade removed, a daughter. I was the bottom rung of the first wave, and easily my parents most challenging kid. My oldest brother was one of those precocious children, who talked as though he was 35 years old by the time he was six. Our middle brother was quiet, but did well in school, and excelled at every sport he ever played (My grandmother actually referred to him as her “Golden Boy”). And then, I came along. Blind as a bat, emotionally unstable, and full of imagination; I was literally walking into walls by the time I reached school age. Between struggles in the classroom, skirmishes on the playground, and little brother meltdowns, I was a kid who required a lot of parenting. And because of my father’s demanding Air Force career, the lion’s share of that fell to my mom. I have no doubt that it was at times exasperating, and exhausting to deal with me. Lord knows, that was the way it felt to be me. But my mother was never one to shrink back from a challenge, and she wouldn’t let me do so either. As much as I wanted to accept the rather overwhelming evidence that I was simply an inferior model, she was having none of it. She made it her mission to ensure that all of her kids would be ready to face to the world, and little by little, I began to pull out of my tailspin. Unfortunately, just about the time I grew strong enough to stand on my own two feet, I began to drift into things that my parents had strictly forbidden. My weak sense of identity caused me to look for the place that I fit in, and resulted in me trying a little bit of everything. In those years, I made many disappointing and hurtful choices, but my parents stuck with me. My mom’s persistent belief, and her prayers of protection, were without a doubt a key to surviving that season. Though I broke her heart many times, she refused to give up on me. It took some years, but the seeds that were planted throughout my life finally took root, and things began to turn. God finally convinced me that my mother had been right all along, and that I wasn’t some sort of defective piece of machinery. In His grace, God allowed me to become a father, where I gained a new appreciation for the kind of love it takes to raise a kid like me. As I look back, I can’t help but think that God gave me to a mother that He knew would be strong enough to fight the battles, and persistent enough to go the distance. Indeed, my mother is an extraordinary person, whose love for me has made all the difference. If not for her, I would not have become the man that I am today. As I look back, I thank God for the love that she and my father shared, which showed us that marriage was meant to last a lifetime. I thank God that she refused to raise boys who sit around in the underwear, watch cartoons and don’t know the first thing about taking care of themselves (or anyone else). And I thank God that after years of dealing with my disarray, He rewarded my parents with their best kid, my sister. Today is my dear friend Jeff’s birthday. We’ve now worked together for over twenty-four years, and in that time we’ve become like brothers. We started out as peers, both working as supervisors in the plant’s decontamination facility. He ran the crew that worked the large parts, and I had the crew that did the smaller parts. Jeff had started out as a worker, years before I got to the plant; and I started as a supervisor, after finishing my time in the military. The first thing I noticed about him was his pension for practical jokes, and I quickly assumed that he just wasn’t a very serious person. But in the years since, I’ve discovered that he is actually one of the most thoughtful and diligent people I have ever known. He is passionate about the things he believes, and he tries to live his life by them. After a few years, Jeff became my boss, and working for him was a real pleasure. Because he believes that family comes first, it was never a problem when situations arose at home. No matter what that cost him in terms of the work, it was a price he was willing to pay so that people could be there for their families. That is typical of my friend Jeff. He is a man of principle and character. Being around him caused me to take a hard look at my own character, and I didn’t like what I saw. His example convicted me, and was a meaningful part of the inspiration that eventually caused my own life to turn. Growing up in the Catholic Church, I was always taught that Saint Jude was the patron saint of lost causes, but I’m pretty sure that Jeff has now taken that baton. He always seems to find himself at the helm of some ship that appears to be headed for its doom. Whether that’s putting a new engine in some ancient mini-van, or running an old, under-staffed, & perpetually under-funded facility; or pastoring a church that has only a handful of congregants left; or giving a second chance to people who everyone else has already written off; or reaching out to families in a local housing project that have long since been forgotten by their neighbors; or running an annual Vacation Bible School to teach under privileged kids about Jesus. He instinctively steps up to take the job that no one else really wants, and holds out hope where there seems to be none. Through the years we have labored, learned, and laughed together. We have embarrassed ourselves just to get a laugh, and we’ve prayed through tears for our family and friends. Hanging around Jeff has inspired me to be a better man, and our friendship continues to be a source of great blessing in my life. My hope is that I could one day be as good a friend to him, as he has been to me. So today, on the 61st anniversary of his birth, I celebrate, and thank God for my dear friend Jeff. Happy Birthday Brother!